So you started your practice’s Facebook page and you are now looking at a daunting, blank business page with zero “likes.” There is no “Field of Dreams” moment here; just because you built it, doesn’t mean they will come. The lowest hanging fruit is your office staff. Step 1: Have each staff member like the page. Step 2: Then have them invite their local friends to like the page. Make it your goal to get about 30 “likes” in the next week or two. Step 3: Start posting before you get patients to “like” you. Would you walk into an empty restaurant? Step 5: Offer a check-in or “like” prize. Advertise at the reception desk that you will give them a prize for checking into your practice on Facebook (this is not an official office check-in, just an announcement on Facebook that they are at your office.) Prizes can range from lip-balm to sunglasses and water bottles. Be creative and fun. Facebook is one of the best and cheapest ways to spark word-of-mouth. 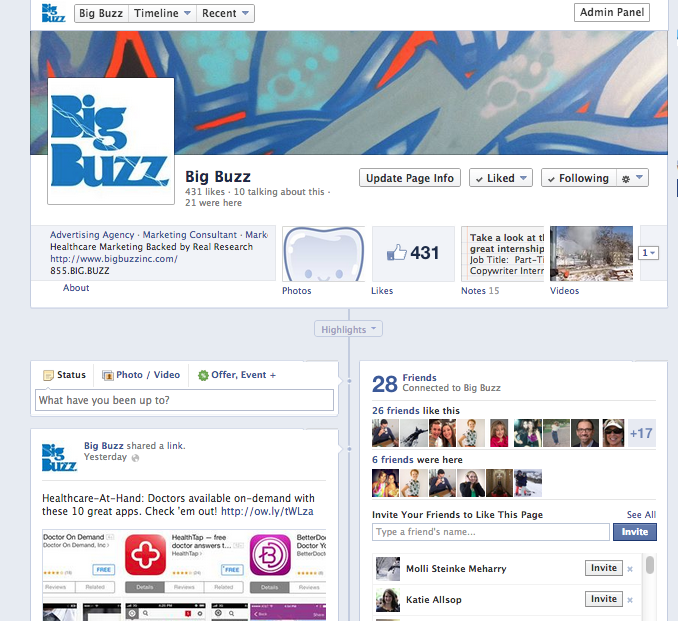 When one of your patients “likes” or checks-in to your page all of their friends on Facebook can see that. Building your Facebook following takes time so stay patient and consistent. The best thing you can do is assign a staff member to own it and post consistently. Or, contact Big Buzz to see how we can help get you to the social media cocktail party!